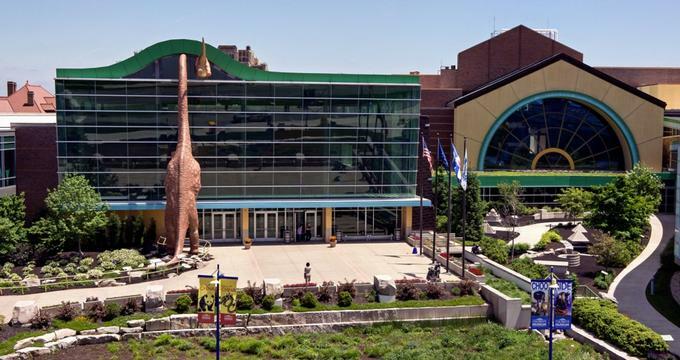 Located in Indianapolis, Indiana, the Children’s Museum of Indianapolis aims to create and foster extraordinary learning experiences to transform the lives of children and families. The museum houses more than 120,000 artifacts that visitors of all ages can enjoy and use to learn about the sciences, the arts, and the humanities in fun and exciting new ways. The Children’s Museum of Indianapolis is a non-profit institution that was founded in December 1925 by local socialite Mary Stewart Carey. Currently, the museum is a 472,900-square-foot facility housed on more than 29 acres of beautiful and spacious land – making it the largest children’s museum in the world! The museum was also only the fourth of its kind in the United States to be dedicated to the interests of young visitors. There are more than 120,000 objects in the museum’s collection, making it the largest youth-orientated museum in the world. Some iconic objects housed at the museum include Bumblebee from Transformers, a working carousel, a log cabin, a mastodon, and even a real mummy! Bumblebee: Weighing in at one ton and encroaching on the ceiling at 17 feet tall, Bumblebee from Transformers loves to greet visitors at the museum. He arrived at the museum in 2011 and there is even a specially designed costume so Bumblebee can come to life and truly amaze visitors of all ages. The Carousel: This antique working carousel is on display underneath a simulated bed of glowing stars. It was originally installed in the amusement park known as White City in 1917. The animals on the carousel are finely carved and hand painted, making it a favorite ride for generations. Edward Black Drum: During the Civil War, combat soldiers were required to be at least 18 to enlist, however, many young men could lie their way into the service at a younger age. Edward Black was 8 years old, making him the youngest solider in the civil war. He was a drummer boy who led soldiers into battle and was taken prisoner during the Battle of Baton Rouge. His drum is now on display at the museum. Lilly Playhouse: The father of a young Evelyn Lilly built his daughter the kind of dollhouse that every little girl dreams of. It was equipped with child-size furniture, a bookcase, a porch with rocking chairs, and even working overhead lighting! Today, the dollhouse is housed at the museum and visitors can walk inside and wish they had the same dollhouse at home! Log Cabin: A 130-year-old log cabin that used to reside in the forested landscape of Indiana is on display at the museum. Visitors can go inside and travel to a different time, when people used to live in log cabins. Mastodon & Polar Bear: In the prehistoric era, mastodons used to roam many parts of North America; today, one of the skeletons is on display at the museum. The majestic polar bear is not as extinct as its mastodon friend, however, they are now an endangered species. Visitors can stand in the shadow of this glorious 1,200-pound bear, reaching more than 9 feet tall. The Mummy Wenuhotep: A 445-pound box arrived at the museum in 1959 containing the carved and painted wooden sarcophagus of Wenuhotep, the daughter of an Egyptian priest from 685 B.C. The Reuben Wells: A strong and handy locomotive from 1868 named for its designer, Reuben Wells, helped to push trains up and down a steep hill in Madison, Indiana. Norman Rockwell’s Scout Memories: A painting originally painted for the Boy Scouts of America in 1931, Norma Rockwell’s painting – Scout Memories – is on display at the Children’s Museum. Toy Trains: Gifted to the museum by Noble Biddinger, the elaborate 2,000-piece collection of toy locomotives, freight and passenger cars, and accessories are on display in the museum basement. Water Clock: When the clock strikes 1:00, the 30-foot water clock in the Sunburst Atrium draws quite a crowd. Designed by French physicist Bernard Gitton, the clock has 29 small globes which empty out in one large whoosh, leaving the globes to gradually refill over the next 12 hours. There are many other attractions and exhibits on display at the museum, including Dinosphere, a paleo prep lab where children can watch paleontologists clean bones and Fireworks of Glass, where visitors can see Dale Chihuly’s contemporary glassworks. There is also Leonardo: The Mummified Dinosaur, Playscape, ScienceWorks, National Geographic’s Treasures of the Earth, The Power of Children, and Take Me There: China. There is plenty to see and do for visitors of all ages and interests.